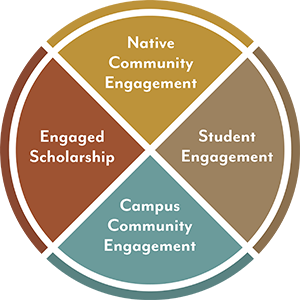 At the American Indian Center, we focus on four areas of engagements. Our specific initiatives are intentionally designed with these four areas in mind. Engaged Scholarship. Engaging scholarship outside the classroom. Our key program for this area of engagement is the Michael D. Green Lecture in American Indian Studies. We also offer various internships & independent study opportunities. Native Community Engagement. Providing public service to Native communities. Specific initiatives include Healthy Native North Carolinians, the NC Native Asset Coalition, and the NC Native Leadership Institute. Student Engagement. Contributing to student personal development. Specifically, we offer our Ambassadors Program as well as programing for our Native Pathways to Professional Disciplines series. Campus Community Engagement. Providing information, education and service to the Carolina Campus Community. Programing includes the Welcome Extravaganza, Elder in Residence, American Indian Heritage Month and various Inclusion and Awareness Trainings.